BLACKFIRE Total Polish & Seal is a light swirl remover, pre-wax cleanser and paint sealant all in one! A lot of one-step cleaner waxes clean the paint, but few have the ability to remove mild swirls. 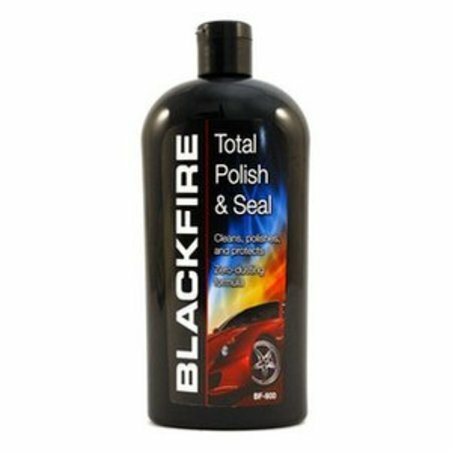 BLACKFIRE Total Polish and Seal can! Mild polishing agents remove fine swirls and minimise the appearance of imperfections. Cleaners remove wax buildup and surface contamination. At the same time, the unique Wet Diamond tri-polymer system cross-links across the paint to form a barrier against UV rays, moisture, and dirt. BLACKFIRE Total Polish and Seal is an all-in-one polish and paint sealant that delivers a smooth shine in one quick step. This is a timesaver that will save your paint finish. A combination of cleaners, polishing agents, and high gloss Wet Diamond polymers gives any paint finish instant shine and lasting protection. This is the perfect product for daily drivers. BLACKFIRE Total Polish and Seal delivers an attractive gloss and the appearance of smooth, clean paint in far less time than a complete three-step detailing process. Total Polish & Seal is designed to provide the shine you want and protection your vehicle needs in a practical, easy-to-use product. BLACKFIRE Total Polish & Seal is designed for easy application by hand or polisher. This unique formula can be buffed until it disappears. There is little or no dust and clean-up is easy.